On the occasion of International Forest Day, the Global Forest Coalition  in collaboration with Critical Information Collective , Global Justice Ecology Project , and Langelle Photography , launched an exhibition  that demonstrates the impacts of so-called ‘green land grabbing’ on local communities. Green land grabbing is a relatively new phenomenon facilitated by forest carbon offset projects and other initiatives (forest carbon projects aim to use trees’ and plants’ ability to absorb carbon dioxide from the atmosphere as a way of compensating for greenhouse gas emissions in industrialized countries). 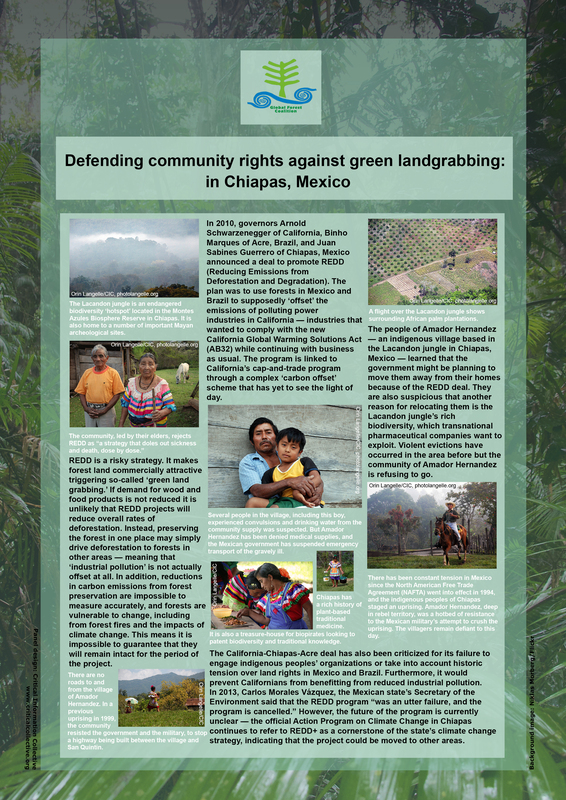 The exhibition, ‘Defending Community Rights against Green Land Grabbing,’ shows how forest carbon offset projects in Africa, Asia and Meso-America have triggered violent evictions and caused fear and uncertainty amongst forest-dependent communities, with women and children being particularly impacted. The exhibition demonstrates how local communities in industrialized countries — like the community in Richmond, California — can be negatively impacted by these offset projects as well. “By allowing major carbon emitters like Chevron to buy offsets instead of eliminating their pollution — as proposed in California’s cap and trade legislation — some of the most marginalized communities in the North have to continue to suffer the devastating toxic effects of industrial pollution in their neighborhoods” highlights photographer Orin Langelle, of Global Justice Ecology Project and Critical Information Collective. The Global Forest Coalition, www.globalforestcoalition.org, is a worldwide coalition of Indigenous Peoples organizations and NGOs from 40 different countries striving for rights-based, socially just and effective forest conservation policies. Critical Information Collective, www.criticalcollective.org (CIC) aims to provide social movements, NGOs and local communities with a useful source of incisive, well-researched and accessible political analysis, which focuses on challenging neoliberal economic globalization and promoting alternatives. Langelle Photography, http://PhotoLangelle.org, uses the power of photojournalism to expose social and ecological injustice. 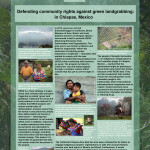 The exhibition ‘Defending Community Rights against Green Land Grabbing’ can be visited online at www.criticalcollective.org. It will be shown, amongst others, at the upcoming climate talks in Bonn, Germany, in June 2014 and the Conference of the Parties to the Convention on Biological Diversity in Pyeongchang, South Korea in October 2014.